As the media keeps selling advertising, they want to shape your view of every little detail of what’s happening around the world in regards to investments. This is the reason why they reporting on an hour-by-hour basis "what’s happening with oil, what's working and what's not, what’s happening in the world, in North Korea…" It’s almost as if we’re in an instant world in terms of how we would react to those things. 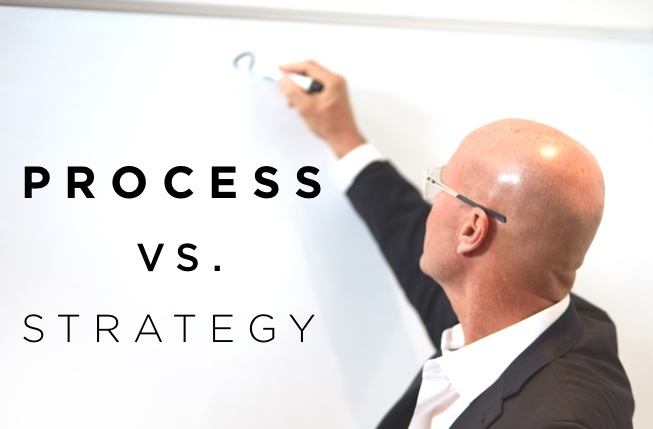 When we overlay in a process environment, it’s more about the long-term strategies vs. what happens in the short run. Warren Buffet talks about it all the time. His holding period and his thought process is: FOREVER. And he can’t tell you what’s going to happen with employment and the markets or any of those other things the media reports in the short run. He said: “Buy good businesses and hold on to them. Then you’ll be rewarded." So, whether there’s an economic expansion or recession—it’s all about having good assets and good businesses. The problem is that most people are fickle. They see all kinds of short-term events and then become influenced by what’s going to happen the next week, month, etc. Then they begin to make rash decisions with things that are out of their control, so they suffer the boomerang effect. They get tugged back and forth, rather than having a discipline and a process that is effective no matter what’s happening around them. A strategy is a way to approach how to do something. A process is about how you make investment decisions and how you stick with those decisions—absent are the economic events and the speculation. Strategies are aligned with what’s happening in the short run. It’s looking for opportunities. It’s looking for: “What’s happening out there in the world that I can take advantage of?" The process says: “We don’t care about that.” We know that if we have a balance of assets, we’re going to rise and fall in good or bad times, but over the long period of time, we’ll be OK. We can’t control short-term events. Nor do we want to try to navigate them. Where the strategy guy says: “I can control short-term events. I can navigate them.” (And they’re 100% wrong!). They get sucked into every minute of watching the tick-by-tick movement of markets and events. That’s where our advertising dollars are heavily influencing this behavior, but it’s not effective. It’s been proven. Lots of people put more emphasis on what stock to buy and what are the directions of the market. Yet, the smartest investor in the world, Warren Buffet, says: “I never know which direction the market is going”, so he puts zero emphases on short-term events and he buys a basket of solid long-term companies that are diversified. So when it comes to investing, most people have their energy and focus on the wrong areas. When your areas have the wrong focus, you’re going to get shaken out of your financial foundation. You’re going to give in to fear when things aren’t working. At walterclarke.com, we switch people from a short-term focus to a long-term focus—from a strategy to a process. We inform them about what they can control and what they can’t control. The end game is shifting understanding and shifting control. Then, when the tsunami does hit, you’ll be better equipped to weather the storm. Because at the end of the day, it’s about making fewer decisions and staying the course. If we can get everyone to understand what their money can support, how to simplify their investment process, and how to make fewer decisions, then they will have a completely different outcome. A much better outcome.